It could be said that the first few years of this current tech boom were fueled by mostly harmless, relatively easy products—websites for sharing your photos, for looking up stuff, for connecting with old friends. And the people who made them were seen as mostly good people. Yet this feel-good perception has slowly and then suddenly disappeared. Users have begun to regard once trusted sites with suspicion over issues of privacy. The same reporters who previously lavished unthinking praise on every new startup now search with equal enthusiasm for scandals and mistakes. Those once harmless social networks, now at a scale unprecedented in human history, no longer look so innocent. The acronym we have for what were once upstarts or underdogs—Facebook to Amazon to Netflix to Google—hints at the now ominous nature of their place in the world, F.A.N.G. What happened was success. What happened was not that power corrupts, but rather, as the biographer Robert Caro would say, what happened is that power revealed. This is the nature of world-altering success. It’s easy to be good when the stakes (and the valuations) are low. We can count on it as an immutable law of history: in any space where fame and fortune and power are up for grabs, Machiavelli eventually makes his appearance. Even if you started as the little guy or you were certified as a B Corp or put ‘Don’t Be Evil’ in your public filing documents. 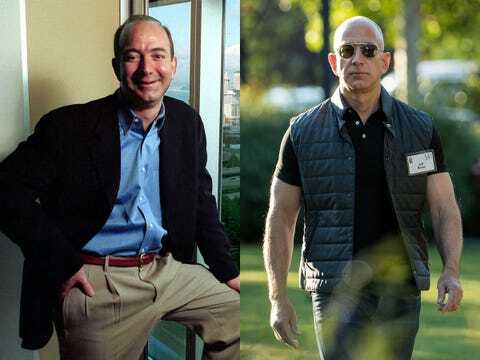 In present day, I like to think of this before and after picture of Jeff Bezos as a good example of the arc of a successful businessman or woman, one that is timeless and perennial. At first, you have a skinny nerdy guy who just wanted to sell us books over the computer, and fended off lawsuits by mega-retailers like Barnes & Noble and Wal-Mart for the privilege. Now, twenty or so years later, he’s jacked like a Terminator—the physical manifestation of his trillion-dollar company which has eaten the world—and his influence is now distributed through one of the most prestigious newspapers in the country…which he owns. We could compare two photos of Andrew Carnegie and see the same thing. Perhaps what’s set Silicon Valley apart—the difference between Elon Musk and John D. Rockefeller, Elizabeth Holmes and Jay Gould—is that it believes, since the disruption” is orchestrated from behind a computer, it’s not the same. That it was somehow cleaner than coal or oil or steel. This is naive. Disruption is painful. People get hurt. And someone has to do that hurting. It’s called creative destructionfor a reason. Good comes from it, but it’s not without its costs—to society or to the people who make it their living. The ability to willfully seek out this destruction on a massive scale is, in its own way, a skill. Not all of us have it. It’s probably better than most of us do not. But certain people do. There are people who tastelessly start a business designed to put bodegas out of business (as one recent start up attempted) and there are people like Steve Jobs who artfully and heartlessly delivered a mortal blow to Eastman Kodak, a 129 year old company, with one addition to his design for the iPhone. And we cheered him for it. Between these two types, there is a Travis Kalanick who saw taxicab drivers not as solid middle class citizens, like many of us mistakenly did, but as a cabal of overpaid, rent-seeking obstacles to be broken apart and put out of work. Indeed, many of the early Uber investors I would speak to about Travis would remark that his greatest strength was his intense will to power. It was this unquestioning drive that allowed him to blow past technological hurdles, monopoly power, local regulations, unions, and in some cases, mob-controlled taxi companies. It can’t be said that power changedTravis. That’s the whole point. It didn’tchange him and that was the problem. He was such a natural fighter that he fought everything, and thus, ensured his own downfall. You can see in Peter’s own development, a hardening that mirrors the evolution of the startup scene. His first company, PayPal, began in an attempt to create a kind of early cryptocurrency and as it got more successful, ended up, in one famous anecdote, having to debate whether to accept payments from pornographers and then after 9/11, whether they were hiding money for terrorists. Facebook, his best investment, went from a fun place for college students to share party photos to connecting the world to being a distributor of fake news. And Palantir, which he founded with PayPal’s anti-fraud technology, began as a big data company…that is now used for drone strikes and SEAL Team Six raids. Success raised their profiles, which raised the stakes. And Peter’s merciless plot to destroy Gawker (itself a former startup that had become an enormously powerful media company)? Thiel was caught off guard when Gawkerouted him as gay in 2007. There was a time he looked to resolve things amicably with Gawker. One Gawkereditor would tell me about meeting Thiel in 2008 and finding him almost painfully naive about the media business, thinking that he could appeal to personal relationships to get gossip journalists to back up. By 2012, he had hardened, sold a billion dollars in Facebook stock, and become convinced that Gawkerwas an obstacle to his business plans, as well as his vision for the future and needed to be crushed. Part of that cold-eyed calculation was the belief that Gawker’s power as a media outlet could not be met effectively in the marketplace of ideas, but rather had to be met with the power of his bank account. Which is what he did. It took nearly a decade, but at the end Gawkerfell and he remained standing. A $300 million dollar company with 300+ employees ceased to exist. Morality aside, there is something nakedly bold about that kind of exercise of power. Just as there is in Mark Zuckerberg’s track record of first wooing and then crushingpotential competitors. Ask Twitter. Ask Snapchat. Ask Zynga. Ask Meerkat. Ask Google Plus. Few have gone against Facebook and walked away—and those that have, do with a permanent limp. Which, by the way, is Zuckerberg’s obligation to his shareholders. The robber baron type of today and yesterday live in a world where the opposite belief is true, and where power is raw and real and there to be used in furtherance of such conspiracies. Too many others, as Gawker was, are misled by their own cynicism and virtue-signaling. They forget how the world works. Gawkercertainly did, or they would not have acted so recklessly or indiscriminately, not only outing married men with children and tweeting things like this, but deliberately making enemies like Peter Thiel—men who accrued real power—and expecting that there would never be a reckoning. Power is sought so it can be wielded. Just as no one builds a multi-billion dollar empire without some sort of savage determination and intense will to power (otherwise they would have stopped at some earlier point, taken their winnings and gone home), no one accumulates power and then declines to use it in the face of existential threats—of which Thiel counted Gawkeras one to his business interests. A Mark Zuckerberg or an Elon Musk doesn’t build an empire and allow others to encroach on their borders. And yet, it says something about our reflective, childlike understanding of the minds of these people that we condemn, the Koch Brothers or George Soros for various schemes, without stopping to think about whythey are doing these things. It’s not simply to save on their taxes, I’ll tell you that. It’s because they have those same “privileged claims to knowledge” and “strong claims of human agency,” that Peter was talking about. They are trying to own the future, or direct it where they want to go. Sometimes we’ll agree with their attempts—such as when Mark Zuckerberg donated $100 million to New Jersey schools—and other times we’ll be shocked and upset—as people have been with many of Peter Thiel’s when he set up scholarships for dropouts, funded seasteading, and of course, destroyed a media outlet. I would argue that this only a taste of what is to come. Silicon Valley was place of a generational—perhaps epoch-level—transfer of power. Nick Denton, the founder of Gawker, himself once observed that New York gossip had transitioned from from Zuckerman (as in Mortimer Zuckerman, the media tycoon and former owner of the New York Daily News) to Zuckerberg. It’s true, and he, and, we, the public, are now experiencing what that will mean. The press, the public, and politicians need to understand this rising force if they wish to put up guardrails against it or put it to good use solving society’s problems. By understand, I don’t mean clutch at pearls constantly, I mean understandit they way we recognize a riptide or the ferocity of a wild animal. Artists need to understand it too, and create works that teach lessons about it. I enjoyed Nick Bilton’s book on Ross Ulbricht, the creator of the Silk Road, for this reason. It’s the story of a boy who ached to do something important and massive, who built a libertarian marketplace where anything could be bought and sold, and did not stop for a second to think of the consequences. It was fun at first, like a kid sneaking around his parents’ restrictions. But this is not kid business, and the savagery soon begins to ooze through. Ross is challenged with questions, with the sticky ethical dilemmas inherent in this small but growing illicit operation. What does he do after the first overdose of one of his customers? How does he sleep with that on his conscience? And the first time he’s told of one user robbing another? Now Silk Road users want to use the site for arms dealing? Can they sell cyanide? Each step, each decision, takes one further from the incorporeal realm and into the brutishness of the Hobbesian world, a world of Social Darwinism. What steps will he take to evade and deceive the police or the agencies that seek to stop him? How will he hide the wealth that has come pouring in? How does it feel to spend money you know came from enabling someone else’s suicide? Ross was one day simply sitting in his room, dreaming his plans on a keyboard, and then another day he had to decide whether to order a contract hit on an employee who threatened to unravel his ambitious attempt to change how society works. He can’t be stopped, he won’t be stopped—what he is doing is too important. The savagery of ordering not just one murder but six would eventually put Ulbricht in a federal prison cell. And indeed he stands now as a cautionary tale, a kind of true story of how one breaks bad. Or rather, fully becomes the bad, as they already were. I wrote about Thiel’s arc from technology investor to Straussian power broker for that same reason. I think we need a wakeup call about how this all works, what kind of forces have been unleashed by the gold rush of California, just as powerful forces and names like Hearst and Stanford and Huntington were unleashed in the original Gold Rush. Because we ignore them at our peril.